Pictured: Kimberly Tran, Hannah Moats, and Melissa Sincel represent THS and Ohio at the FCCLA National Leadership Conference in Nashville, TN. 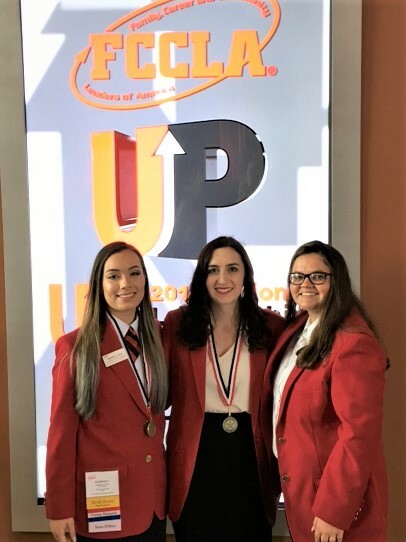 Three THS students attended the National Leadership Conference for Family, Career and Community Leaders of America (FCCLA) in Nashville, TN July 2-6. The journey to Nashville began in March for Kimberly Tran and Hannah Moats with the FCCLA Regional Competition held at Tallmadge High where both qualified to compete at the Ohio FCCLA State Leadership Competition in Columbus. Both girls earned gold in their events and qualified for the national competition with the highest scores in their respective events. In Nashville, Kimberly Tran, again, earned gold for her Chapter Service Project Display presentation. This presentation explains the work the high school FCCLA members did over the entire school year to prepare Dare to Share food bags which were distributed each Friday to students throughout the school district. Hannah Moats, a 2017 THS graduate, also earned gold for her project in the Interior Design STAR Event. Hannah will be attending Kent State University and plans to major in Fashion Merchandising. She will spend the fall semester studying in Florence, Italy as part of her Freshmen Honors College experience. Melissa Sincel also attended the national conference and completed the ENGAGE Leadership Academy. Melissa gained new skills and collected many ideas to bring back to THS and share with all the chapter members. It has been an amazing year for FCCLA at THS. Lauren Bradshaw and Melissa Sincel were both elected as Region 2 representatives to the Ohio FCCLA Regional Executive Council and Kimmie Tran was elected to the Ohio FCCLA State Executive Council where she will serve as Vice-President of Service Engagement. Family, Career and Community Leaders of America is a nonprofit national career and technical student organization for young men and women in Family and Consumer Sciences education. Since 1945, FCCLA members have been making a difference in their families, careers, and communities by addressing important personal, work, and societal issues through Family and Consumer Sciences education. Involvement in FCCLA offers members the opportunity to expand their leadership potential and develop skills for life -- planning, goal setting, problem solving, decision making, and interpersonal communication -- necessary in the home and workplace.